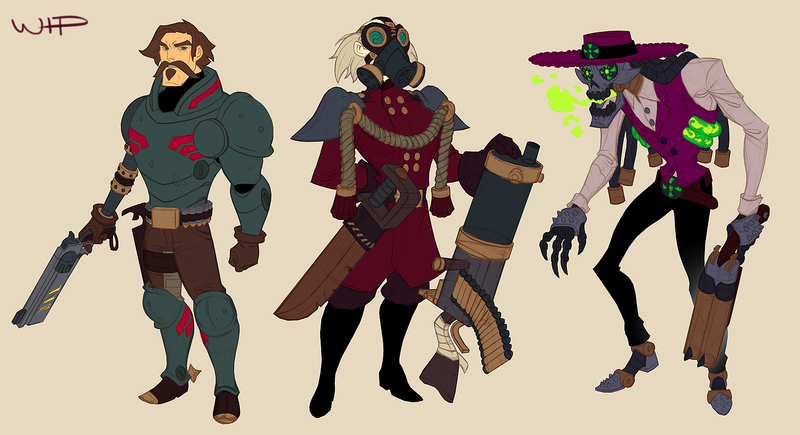 Here are some colorflats. Wip obviously :) If you guys only knew how many times I try to draw these, and then totally scrap that drawing and make a new one! Mwahaha, it's my secret :) I think one of the things that's changed for me since I began working as a professional, is that I'm more stubborn now. When I was an amateur I would only draw an image once, and be satisfied. Now I'm more like a pitbull, doing it over and over til I've reached what I intended. I never get it right in the first go. It's maddening. Drawings on A4 copy paper with blue lead 0.5 mechanical pencil (doesn't easily erase :/, but has a great elastic soft feel to it). Colt Tombgrave, Colonel Cyanide and Dreadskull. Now off to learn how colored lights influence different colored objects, wooO!